TLC3 – Richard at Rathbane with Paul O Connell, Tracey Lynch, Tait House Community Enterprise, JP McManus and Luke Culhane, Limerick Person of the Year. Picture: Cian Reinhardt/ilovelimerick. Team Limerick Clean-up3 (TLC3), Europe’s biggest ever one-day clean-up took place in Limerick this past Good Friday with over 16,500 people taking to the streets of Limerick city and county to take part in the occasion. 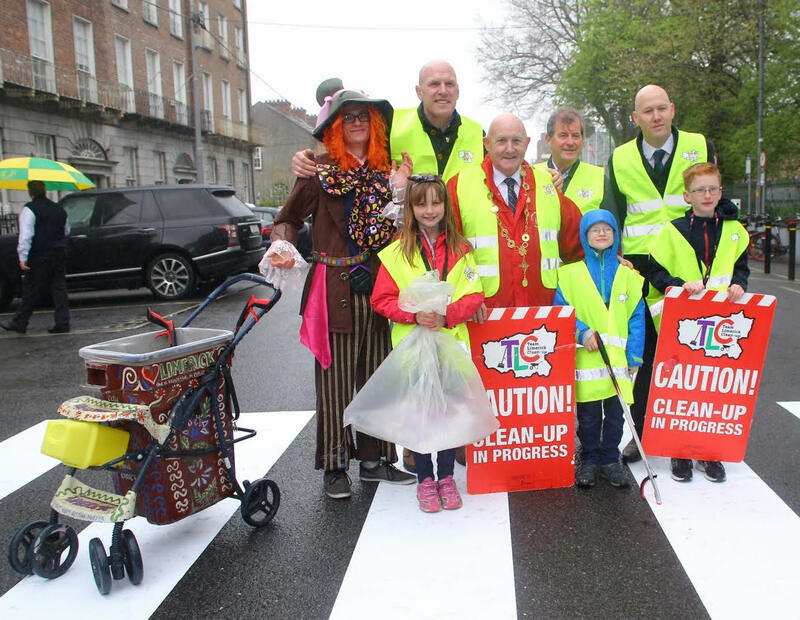 This is the third year for the Team Limerick Clean-up initiative to be staged and last year’s event attracted over 13,000 volunteers. Sponsored by the JP McManus Benevolent Fund, TLC3, is spearheaded by Paul O’Connell and was launched at Pery Square in Limerick city where volunteers joined JP and Paul as they recreated the famous Beatles Abbey Road Album cover in preparation for the massive event.TLC3 brought a diverse range of volunteers together including families, community groups, schools, residents’ associations, parishes, businesses and sports clubs from all over the county to clean-up their local area in a bid to make Limerick the tidiest and cleanest county nationwide. It is estimated that 50,000 bags of litter will have been collected on the day by the event partner, Mr Binman. This year, also saw the largest ever tea/coffee gatherings for volunteers which were hosted at over 300 hundred locations throughout the county. These took place in people’s homes, community and sports centres and schools where over 5,000 people attended to celebrate their clean-ups. Commenting at the launch, TLC3 sponsor, JP McManus said; “The number of volunteers this year has exceeded all expectations and we are absolutely delighted with the turnout. For me, TLC has become synonymous with Good Friday and being part of the occasion gives me enormous pride. With over 5,000 people joining their friends and neighbours for a cup of tea afterwards, it has become far more than a clean-up, but a way of developing a great community spirit in localities around Limerick. Paul O’Connell added: “The comradery that makes TLC such a successful campaign is at an all-time high and we hope that this trend continues with each passing year. “Some volunteers today were recognisable faces, with members of the Limerick hurling and Munster rugby teams taking part which added to the excitement and atmosphere on the day”. TLC3 is sponsored by the JP McManus Benevolent Fund and is co-ordinated by Limerick City and County Council and kindly partnered by Limerick’s Live 95FM, The Limerick Leader and Mr Binman. To read more about TLC3, click here.